Nikon says it's working on a "permanent solution" for a problem where its professional D4 and D800 digital SLRs may lock up or "freeze" during usage, causing the camera to become unresponsive. The company stressed, however, that the issue seems to have affected only a "small number of D4/D800 users" and that there is a temporary fix to the problem if it does occur. The fix requires the user to turn off both the Highlights and RGB Histogram on the display though Nikon did not explain why these features might be causing the problem. The following is a statement from Nikon Inc. sent to PDN in response to a problem we had with an early review unit of the 16.2-megapixel Nikon D4, which locked up during usage on several occasions. The camera would only start working again if we took out and reinstalled the battery. "Nikon has received reports of a small number of D4/D800 users who are experiencing 'locking up' issues, where the camera becomes unresponsive until the battery is removed and reinserted," Nikon's statement reads. "Nikon is investigating a permanent solution to this issue and will update users accordingly. To immediately resolve this issue, users can turn off both the 'Highlights' and 'RGB Histogram' display options in the 'Playback Display Options' sub-menu found in the 'Playback' menu. Nikon apologizes for any inconvenience this may have caused users." We mentioned the lock-up issue in this review of the D4, noting that the problem occurred while we were shooting consecutive JPEGs in single shot mode mode, not as a burst. We returned that D4 test camera to Nikon and received another unit and did not experience the same problem. It was unclear whether the lock-up issue with the first D4 was an isolated glitch in an early review unit or part of a larger problem. 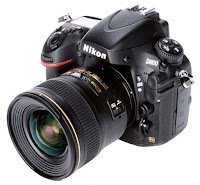 The Nikon D4/D800 lock-up issue has been mentioned by users on some websites and forums, including Nikon Rumors which devoted a post to the problem on April 7, 2012. That story garnered 289 comments, many of them from D4/D800 photographers whose cameras were locking up or "freezing." In a review of the Nikon D800 on Photofocus, photographer Scott Bourne also mentioned a similar issue. "The other problem I experienced relates to the camera simply locking up," Bourne wrote. "The only way to fix it is to take the battery out. I don’t know if I have a bad copy or it’s a random problem, but I assume it’s something that can be fixed with a firmware update if it’s widespread." Nikon has not said whether the permanent solution will involve a firmware update for the D4 and D800 but it seems likely.